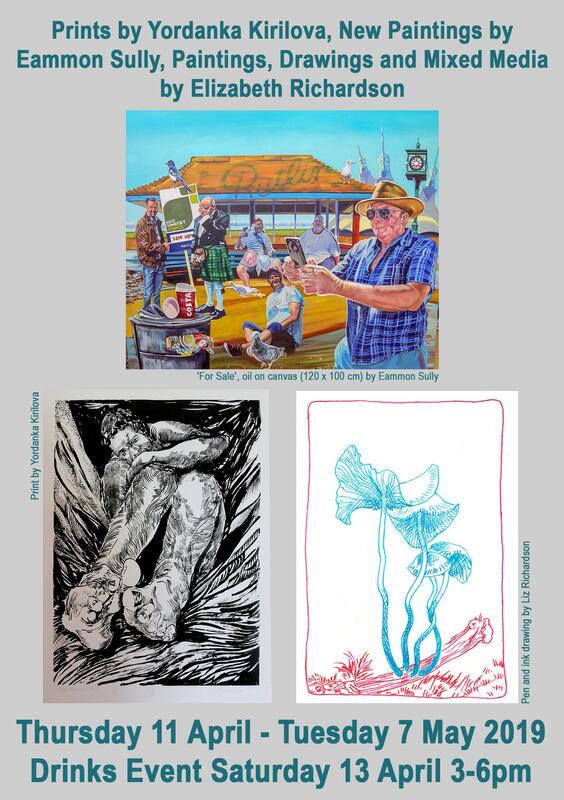 This exhibition brings together prints by Yordanka Kirilova, new paintings from Eammon Sully and paintings, drawings and mixed media from Elizabeth Richardson. Yordanka Kirilova is exhibiting for the first time with LT Gallery after graduating from Plodiv Academy of Music, Dance and Fine arts. Yordanka uses a wide range of print techniques such as intaglio, etching and serigraphy. Eammon Sully Eammon has lived in West Somerset most of his life, he was accepted to study Contemporary Art at Weston College and graduated with a BA degree in 2018. Primarily a painting working with oils, Eammon draws inspiration from his current culture; the people and places that have influenced and shaped my life form the basis for my work. Elizabeth Sully works with a wide range of disciplines including mixed media, resin, illustration and is currently very fond of gouache paint. Elizabeth takes inspiration from nature such as flora, fungus and fauna, which can be seen throughout her work.